Sipsey Street Irregulars: This is not going to end well. 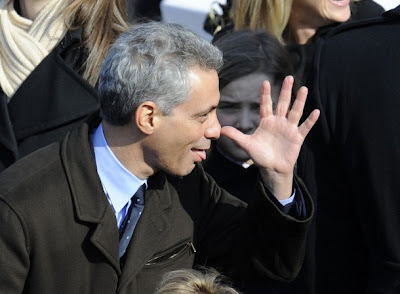 Rahm Emanuel thumbs his nose at Republicans during Obama's Inauguration. Rahm Emanuel, described elsewhere as the "second most powerful man in America," has given us a taste of where we're headed. The arrogance of the man fairly screams. Guys like this start wars that get a lot of people killed. Rahm yuks it up with the Brady Bunch. I am not convinced they have the political clout to pull it off. The will? Yes. The ability? Maybe. As long as we stand firm, stay vocal, and remind them that we use ballots as effectively as we use bullets, there is every possibility the battle will remain a stalemate with neither side gaining or losing substantial ground over the next four years. Surely they realize that unlike inner city gangs, serious gunowners will not fade into the shadows when their backs are against the wall. If they don't, they'll learn. Greyhawk: Post-porkulus, their next moves are critical. If they immediately start moving on amnesty for illegals, you'll know they've decided to seize power by "majority rule". 15 million plus new faithful laborers on the Democratic political plantation will turn red states like Colorado and even Texas bluer than blue. They will get away with it and won't have to worry about a 1994 reaction. By the rules they follow in the universe they inhabit, it will be "checkmate" on the GOP. What they don't realize is that the GOP is the least of their problems. We have the power to kick over the board and start a new game. These people are intoxicated with the power that they feel that they have. They believe that they can do anything that they want. They have No understanding what "Shall not be infringed" means. Pray that God will give you the courage and strength to stand up to these tyrants in the upcoming days. One thing we must keep in mind at all times is the definition of "criminal." Every time they (or we) say anything about keeping guns out of the hands of criminals we have to remember just who is a criminal and what it took to make him/her into such. There was a time when spanking a rowdy child was a normal reaction of a normal parent. Now, because of the Laughtenberg Amendment, it can result in a lifetime ban on possession of firearms. Charges that once were considered minor are now elevated to felony status and felons (there is no longer any such ting as an ex-felon) can never legally own a gun. 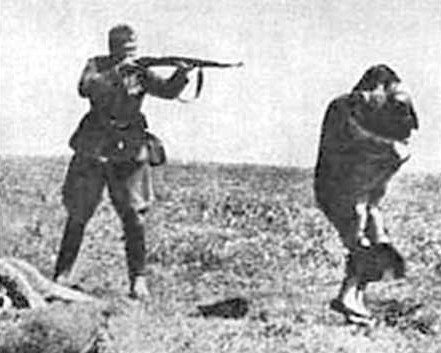 This is where legislatures can (and will) strip gun rights away from the vast majority of the people. Let the Second Amendment stand but expand the grounds for those "reasonable restrictions" that Scalia left the door open to. Personally, I cannot find "reasonable restrictions", anywhere, in the Constitution. I feel that anyone and everyone has the right to protect themselves. I do not care if the PTB has labeled them as a "felon" or not. I agree with L. Neil, that ANYONE should be able to go into their favorite store, and plunk down the cash for ANYTHING that their little hearts desire, ANYTHING froma .22 Chipmunk to an M1 Abrams. Definitly must give them an A++ for imagination. Perhaps the no-fly list should be the basis to strip all civil liberties from us. That would certainly make it so much easier for our "benevolent leaders" to take care of us. If they're gonna do it, I wish they would just get on with it-- the suspense is killing me. The Dems do not have the GOP in checkmate: they are both playing on the same team. Their call if we take up ear collecting. I ain't averse to the hobby. Give me something to hang on the walls in my trophy room with the weasels, rodents, and martens in it. If one is law-abiding today, never fear, you'll be a criminal tomorrow for doing nothing more than has been fine to do from the day you were born until today. That is how tyrannies work - constant fear of breaking the law takes up your time and energy. One of my great-uncles got out of the Ukraine in the mid-1990s (at age 87) and told of how he had been walking home from work in 1951 (still under Stalin) when a carload of NKVD thugs (predecessors to the KGB) "invited" him to a long discussion at their local HQ. After he described the incident, I asked him "why did they do that?" He replied, "that is how you terrorize a population - you let them know that you are watching them constantly, and that you can grab them and toss them in prison (or shoot them in the head) at any time . You're too afraid to say anything, let alone do anything, that would upset the authorities." It is coming here - very gradually. They want all of the frogs to stay in the pot.